Buckets, a $4 task-management app from Press Start, aims to help you take control of your task list. The app features some clever interface elements, but is saddled with far too many annoyances for daily use. Buckets List: Buckets has some creative concepts—like adding a task right from the app’s main screen—but it also has some weaknesses, including amateurish icons and empty projects that are difficult to edit or delete. The app’s most creative concept is also initially its biggest flaw. Instead of forcing you to tap into a separate screen to add a new to-do list item, you add a new task right from the main screen, with a slimmed down, in-line text entry field. Unfortunately, that tap-saving feature means you can’t include the extra granular data you want to associate with a particular task (like due date, priority level, recurrence, notes, or the broader project it’s a part of) when you add it. 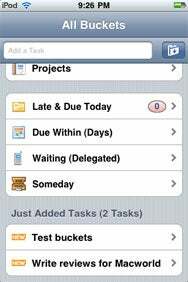 Instead, you’re forced to create the task, then navigate to it (via “All tasks”), find the newly-added task at the bottom of your to-do list, tap it, and finally make your edits. The theoretical time-saver becomes a massive frustration point… until you check the Settings app. There, you can (and should!) enable “Add Details w/ Task”, which smartly allows you to add those details immediately after you create a new task. Unfortunately, other weaknesses in Buckets aren’t as easy to work around. Tasks are inexplicably truncated in the to-do list view (“Write reviews for Mac…” instead of “Write reviews for Macworld”). The icons range from bizarre (a cell phone for some reason represents tasks that you’ve marked “waiting”) to amateurish (the overly pixellated “new” badge). The implementation of projects—which are, indeed, “Buckets” of to-do list items—seems a bit buggy, too; I ended up with two empty projects named “none,” and I have no idea how, or how to delete or rename them. By the time I finished testing Buckets, the only thing left on my to-do list was deleting the app from my iPhone. Buckets is compatible with any iPhone or iPod touch running the iPhone 2.2.1 software update.